My Name is Memory [Book Review] – my books. my life. 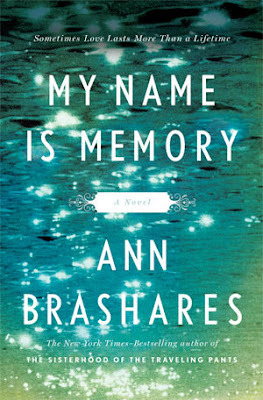 While I will admit to enjoying the Sisterhood of the Traveling Pants movies, I wasn’t a big fan of book, so I wasn’t as excited for Ann Brashares’ new novel, My Name is Memory, as others seemed to be. But then I read review after review that praised it so I thought I’d give it a shot. Thank you to all of you who posted those reviews, because without those, I would never have picked the book up and I wouldn’t have found the wonderful reading experience that lies within it. My Name is Memory is the story of Lucy and Daniel. Lucy is a normal teenager when she meets Daniel, but Daniel is different. He has the memory of his past lives and he recognizes Lucy’s soul as one he has known over and over for hundreds of years. Throughout their history, they have always had obstacles – she’s too rich, he’s too young, she’s married to his brother. He has been waiting for the time when they can finally fall in love and grow old together. In 2004, they are finally the same age and in the same place. But there are other obstacles waiting for them. This whole soulmate, reincarnation thing could be really cheesy. But Brashares manages to tell it in a fascinating and uncheesy manner. I practically read it in one sitting. I loved the jumps back in time and learning the history of Daniel and Lucy. The whole book was like unwrapping an incredibly long love story one layer at a time. I’m not sure I loved the ending. I won’t explain why because I don’t want to spoil anything for you, but if you’ve read it and want to discuss, I’m game. Despite this possible shortcoming, I really did like the book and I recommend it for anyone who’s in the mood for a jaunt through history and the love story of a couple overcoming the obstacles their many lives throw at them. EDIT: Jennifer has informed me that this is going to be a trilogy. I am now perfectly satisfied with the ending of the book knowing that more is to come. I had this one on my tbr list but after reading your review it’s going on my library queue. Great review! I find that sometimes Brashares goes down the cheesy road, but her stories are always so enjoyable that I always forgive her. I have this on hold at the library and I can’t wait to get my hands on it! Like you, I didn’t really enjoy The Traveling Pants’ book, so I never picked this up to read. I guess now I should.. I agree about the end, I think it didn’t bother me because it will be a trilogy. I see a lot of potential in the series, and i’m very excited for the next one. Thanks for linking to my review as well. This book is a total and complete rip off. I just finished Lauren Kate’s “Fallen” series, and I saw this in the library when I went to return it. The cover looked interesting and I read the summary, but by the time I was done, I was practically seething with rage. It’s almost exactly the same plot (even the character’s names are almost exactly the same!). If I were Kate, I would sue this thief for every penny she has.